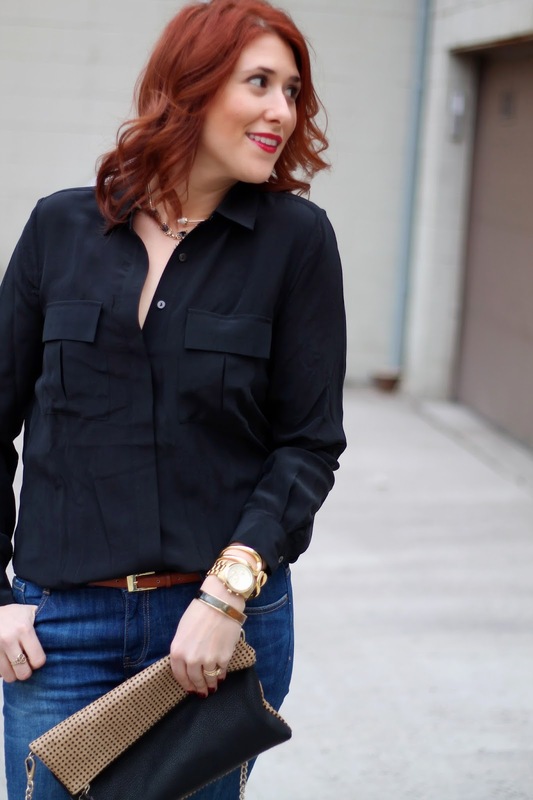 Most days black isn't my color of choice, but this silk blouse had been sitting in my closet since I found it in the Joe Fresh clearance section for just $8 back in December! And we all know I love me a good silk blouse. So since it was casual friday I committed to the casual look with jeans, this silk blouse and loafers. Of course a bold red lip didn't hurt either! I got that same blouse - but mine was TEN dollars! Oh the unfairness of life! I am obsessed with silk blouses and love that Joe Fresh does their JCP line, making them so affordable. Black might not be the go-to, but it sure is nice to have around. Fantastic and Affordable.. LOVE it! Cute outfit! I am loving those leopard flats and that Loft bag so much. Such a great outfit! Love your coat and flats!